Here are spheres riddled with countless spots, pores, entrances which seem to lead to the depths. Namgoong Whan paints something indefinable that reminds you of sponges, embryos, or perforated epidermises of animals or plants. The artist paints everyday in his studio these globular shapes which look like an exploding object sometimes and other times, a black hole absorbing all things in the cosmos, as if practicing asceticism. Or rather, he might be indeed an ascetic, at least in the moment of painting them, because what is most required in his working process is a tremendous degree of concentration and bodily control which admits no room for error. His paintings use a brush, water and Korean ink equally as in Korean ink or watercolor paintings and are completed by placing thousands of the same dots, so that even one mistake will stand out promptly and prominently. Each spot is a combination of a thick black area and a surrounding blur in an extremely tiny space as a result of applying the technique called “xuanran”, or “seonyeom” in Korean. This Asian version of the sfumato method, that is, adding Korean ink dots one by one on paper dampened with clean water with total concentration brings a special intensity, having the effect that figurative reality and the dreaminess caused by repeated brush strokes exist together in the same picture plane. 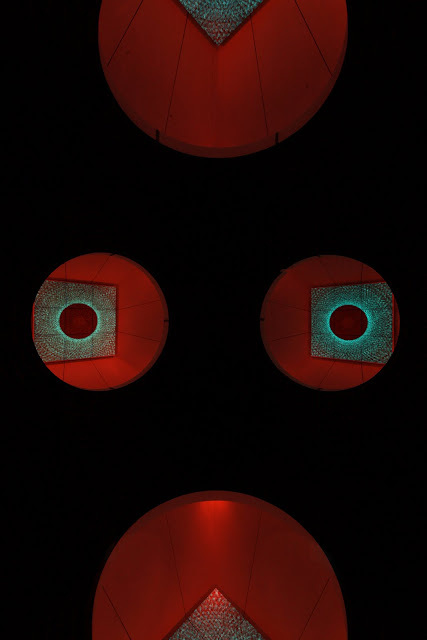 This intensity, which seems to abstract the viability of metamorphosing organisms, the condensation and implosion of energy, and even religious exultation, is the consequence not only of his technical skillfulness but also of his deep immersion in the working process that is as much as performance art. 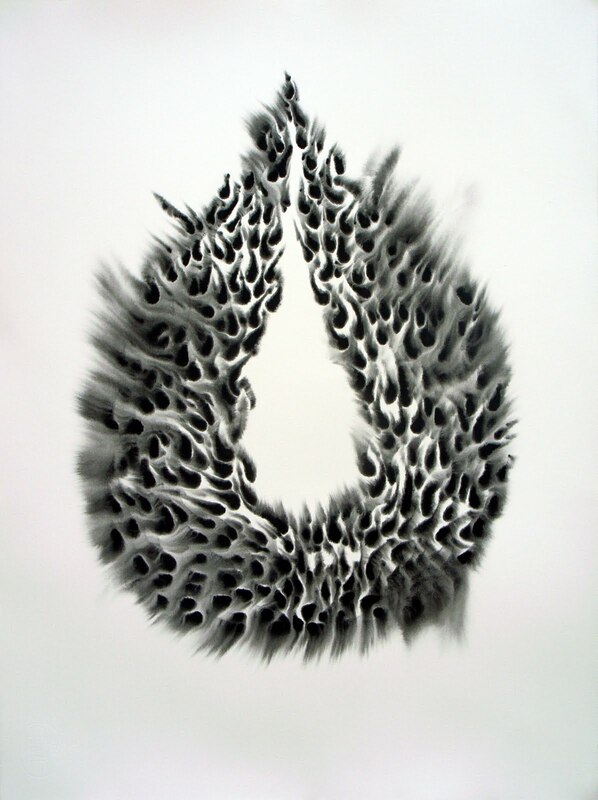 Namgoong has continued this kind of drawings using Korean ink dots since 2007. 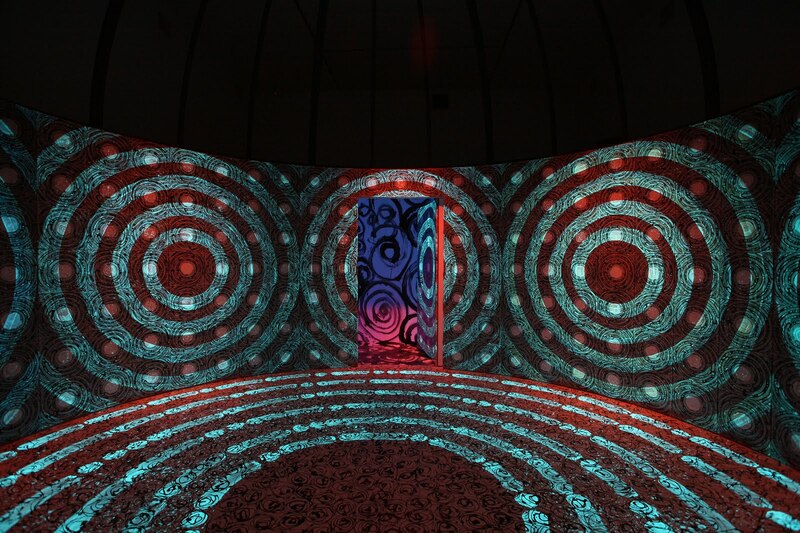 In fact, this project titled Transmigration is an extension of the previous works of the same name. He has been worked with the theme of “souffle”, a French word meaning ‘breathing’ since 1998 and already began to employ the title Whangoong: Palais du Soufflefor his graduation exhibition of Seoul National University, Korea. Immediately after graduating from college, he went to France for study, where he produced large scale paintings with gestural brush work since 2001. 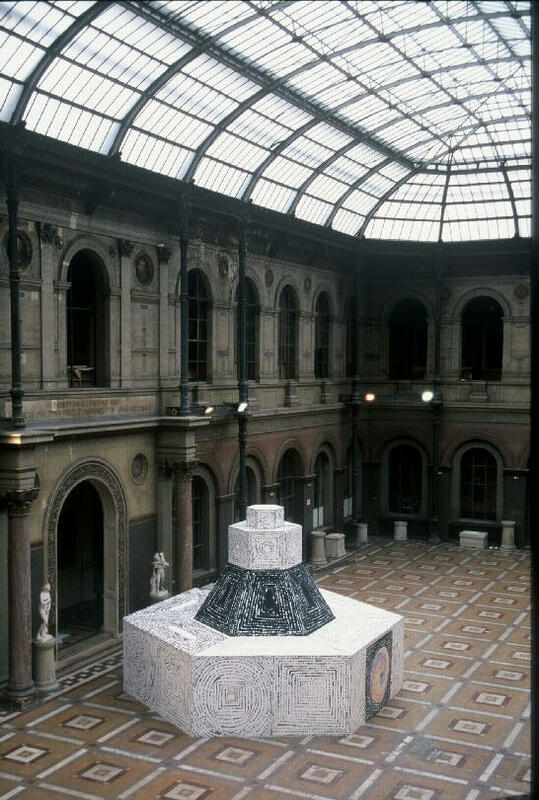 The largest of them all are the installation work of the same title, Whangoong: Palais du Souffle, created in The École Nationale Supérieure des Beaux-Arts in Paris in 2002, and Transmigration―l’arc-en-cielmade for the exhibition at Kumho Art Hall in 2005. These are almost temple-like circular rooms built up by the huge walls of regular square canvases which are full of concentric circles painted on numerous small circlets. In the solo exhibition held at Gallery Wooduk, Seoul in the same year, the artist established a vertical rotational axis between the floor and the ceiling, to opposite sides of which are attached his paintings in order to revolve. These works became the foundation for the Palais du Souffle series presented at Whanki Museum, Korea in 2008 and this 2009 exhibition. What is notable is the function of phosphorescent pigments applied in these installation works. Each work renders dramatic space in its own way under the indoor lighting alternating between brightness and darkness, which had some hallucination effect. 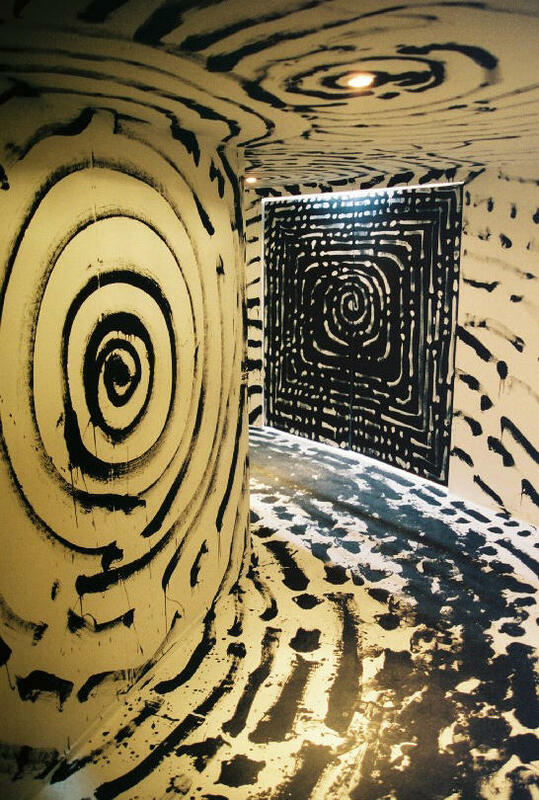 This effect is in line with the visual overwhelmingness of the density of his Korean ink dots. 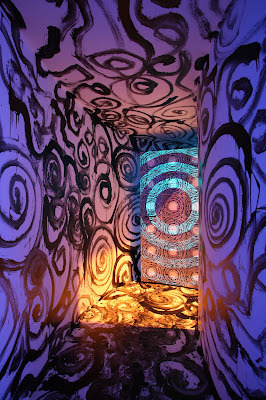 In Palais du Souffle presented in 2008, concentric circles of different sizes appeared and disappeared repeatedly inside the round, double-layered walls according to the ever-changing lighting, and the space between the walls are filled with different installation paintings in order that the viewers would be able to experience different spaces as they proceeded. By emphasizing the repetition of small pictorial units as well as the contrast between them and the enormous structure as a collection of these units, these works anticipated the accumulation or fractal form found in his later ‘Korean ink dot’ paintings. Considering the nature of the fractal pattern that a part includes the whole and the whole is identical with a part, the organic repetition in his works could be associated with the Buddhist thought of ‘indramang’or the internal representation system of Leibniz’s monad philosophy. According to Gilles Deleuze, a monad has within itself the particles of light and darkness which represent the world according to the hierarchy of neighborhood〔voisinage〕. Thus, ‘repetition’, to put it tersely, means that the world is repeated in a particle, and its accumulation implies that the same event also occurs in a much bigger or smaller dimension that is not yet visualized. Namgoong says that these are also his own portrait. It might be so not only because the painted mass of light and blackness has a round face-like shape but also because the spiritual mode of the countless disruptive pores and flames covering over the surface resembles the artist’s mentality. Furthermore, the multi-morphology consisting of the painting serious that are identical every time but complex and multi-layered also reveals the ever-changing mode of the subject quite successfully. Nevertheless, his paintings should be understood as a reflection of the existential moment of all of those who look at them, as well as the artist’s portrait. Their distinctive abstract quality is, above all things, exclusive in a great many representational attempts to disclose the universal spiritual structure. They may provoke surprise and fear at first, but in no time produce more powerful similarity and reflection due to the sympathy generated from the elements of them. When Namgoong says of ‘transmigration’, it means the metempsychosis of the subject as a multi-morphology overlapping infinitely with infinite layers, which is born again numerously but differently for each case and always renews itself. It reminds you of something like the bursting surface of a supernova which changes every hour because of the inner energy soaring upwards. Nevertheless, his paintings which present these images using traditional materials and subject matter, are extremely calm and moderate. Each image is projected on paper in such a determined and accurate manner as if it is a kind of spiritual inscription. The contradictory coexistence of the two states, exultation and serenity, is recorded in his works as it is. Possibly, this might be what transmigration is like―the mixture of intensity and intimacy. If the artist is opening up a new type of painterly or traditional domain, it would be so in this very point.